Hungarian Vizsla Forums > General Vizslas > General Vizslas > How to find Vizsla pedigree/line that doesn't gray "early"? How to find Vizsla pedigree/line that doesn't gray "early"? I recently met a Vizsla who was 5.5 years old, but I would have guessed much older based on the amount of gray on his muzzle. Reading up on this forum, it seems the age that Vs gray varies quite a bit, though many posters have reported that their dogs started graying on the chin at age 3-4 with some dogs having a good amount of gray on by age 5-6. A few have reported their dogs have little to no gray at age 6-7. Personally, I'd prefer a dog that doesn't age until he's actually a senior (perhaps because I'm 50 and have very little gray). Any tips on how to find such a line or what to exclude in my search? I'm assuming I'll be looking a dams/sires that are in the 2-4 year old range so may not have a sense of the parents in this regard. Is it a sensitive topic to ask the breeders about (in terms of grand-sire/dams)? I realize that some of you will be thinking that this is a "shallow" criteria - if you feel this way, please know that temperament and health are equally or more important for me. However, if I'm going to spend the kind of money that a good puppy commands, I feel that I should try to get what I'm looking for on all 3 factors. Right? Re: How to find Vizsla pedigree/line that doesn't gray "early"? If we can't convince you that this doesn't matter...hang out at a few shows and watch the veterans. That may help you see how gray (or not) different lines are. Personally, I don't think there is anything more beautiful than an older V's sweet white face! You should be more concerned about the critical things like hip displaysia, eyes, thyroid, heart and cancers rather than at what age and the amount of grey that your dog will have. Every good breeder will have this information on the parents of your puppy. And a good breeder will be concerned about bettering the breed and to whom they sell their puppies to. Oh and by the way-my sister went really grey at 30 years old and she is drop dead gorgeous! MCD, what makes you think I'm not more concerned about health and temperament, for that matter? I specifically spelled out that I do. My wife's brother also grayed, then balded in his 30s and he remained handsome man that he was with hair - but everyone thought he was 10 years older than his actual age. Victoria, great suggestion. And I agree with your comment about an older V's white face. But I think of old as 9+ year, I don't think a 5-6 year old V is old. My question is eliciting holier than thou attitudes - I guess I'm not surprised, though I hoped my honesty would be met with understanding, not mockery. But anybody on this forum who thinks they, as breeders, don't breed for a certain look or appearance is totally full of it. Everyone has their preference and I am entitled to mine. I see many photos of champion Vizslas that are fine boned, almost rust colored statuettes that look nothing like the winning show dogs in Europe for example. Early graying is really just an aspect of appearance. I encourage you to think about it that way before you mock. Owner of Chloe. Graying muzzle at 5.5 years and Bailey, no gray at 5 years. "Any specialized attempt to breed our Vizslas strictly for the show-type will eventually invite degeneration in character, strength, and hunting ability. Only by selectively breeding completely trained outstanding male and female specimens can any hunting breed be improved or kept up to the proper standard. For over a thousand years the Vizsla has been a robust, brush-busting companion hunter, full of fire and ready to please. Let's keep him that way!" "At this time we must not in the least be concerned with white markings. Our first obligation is to preserve the natural hunting instinct and we shouldn't care much about a white toe, or toes, chest if the dog has a good nose, ranges well and has plenty of bird sense. If the great breed masters of Czechoslovakia and Hungry found it undesirable, and perhaps impossible, to breed out the white in the past ten centuries, I see no reason why we should try at this time. The chief rival of the Vizsla in the field are the English Pointer and the German Shorthaired Pointer, and neither attempts to breed out the white. We Americans like to improve on things and there are no doubt some among us who honestly believe they can do more for the Vizsla in a few short years of selective breeding that the old master, the breed wardens themselves have done in the past 10 centuries. The white could possibly be bred out. The breed has a striking appearance with a surplus of eye appeal, beautiful golden coat, dignified aristocratic bearing, pleasing conformation, good disposition and style. All the earmarks of a terrific bench prospect. But let us not forget the past history of the beautiful Irish Setter. 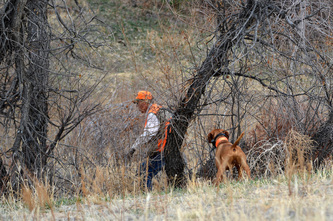 Originally the Irish Setter, like our Vizsla, was a dog of striking color with white markings on the chest and feet. Even today traces of white do not disqualify. He was imported mainly for use on upland game and played an important part in the early days of field trials. They were outstanding field specimens. However, many fanciers attracted by the dog's good looks began to breed for bench only, and his working qualities were ignored. There has been so much concentration on breeding beauty into the red Irish Setter, that his gun-dog abilities have been almost forgotten. The Irish Setter Club of America has been making advances toward field utility in the past few years, although it is unlikely that the breed will attain the popularity afield that it once held." Ok...... my turn to apologize for my comments. I think it might have been the order in which you listed your criteria. Personally I married a gentleman who as salt and pepper/gray hair who is 49 years old. To each their own opinions. I think your best bet would be to ask to see pictures of the grandparents, great-grandparents, etc. Ask how young they were when they first started to go gray. I personally think it's good to ask lots of questions of your breeders, especially if a certain trait is important to you. While I agree that this kind of thing should take a back seat to genetic disorders, temperament, and overall structure, if it's important to you, it's important to you, and worth asking about. There is likely something hereditary going on with the age at which an animal begins to gray, since it would be a function of the melanocytes and their melanin production. So going back a few generations and assessing how young they were when they went gray would be a good, but not fool-proof, start. Wally, I understand your concerns! As they say, you can never be too young or too beautiful or too rich. Why not dogs? You're attracted to them in their prime, which is no white. And beautiful. You want them to be that way forever, or at least as long as possible. V's are very human, as you've undoubtedly discovered if you've spent time around them and talked with their people. Part of that is they age noticeably, the way we humans do. And, like us, it's hard to tell how they'll age and when. I've seen 10 or 11 year olds with no white and 3 or 4 year olds developing it...and sometimes their parents have a much different grey pattern! Sometimes, litter mates, too. If you're still interested in one in New England, I might be able to help you out, PM me. ......everything else is just a dog. Of course, they grow on you and you won't notice anything, except their personality.